As part of its efforts to build meaningful bridges with Latino communities, Indiana University will sponsor and host an exhibition booth at the 2018 Indiana Latino Expo. Held on Oct. 13 at the Indiana State Fairgrounds, the Indiana Latino Expo will offer families and prospective students the opportunity to learn valuable information about the many educational opportunities available through IU. A central focus of IU’s involvement in Indiana Latino Expo will be its 21st Century Scholars Day, held in the exhibition hall from 9:00 a.m. to 4:00 p.m. During this time, prospective students and families can visit the IU booth to find out more about the 21st Century Scholars Program, a program that offers qualified Indiana residents a four-year, full-tuition scholarship to any public Indiana university. In addition to being able to sign up for the 21st Century Scholars Program, current Scholars can also visit the booth to fulfill their requirements to stay on track with the program. Representatives from the Indiana Commission for Higher Education will also be available to answer questions and help advise Scholars on fulfilling their requirements. In addition to the programming offered through 21st Century Scholars Day, there will be plenty for visitors to do at the Indiana University exhibition booth. Attendees can take virtual tours of IU’s campuses, reconnect with IU alumni, and pose in the IU photo booth. In addition, students who are interested in applying to IU will receive an application fee waiver if they apply at the booth during the expo. Now in its seventh year, Indiana Latino Expo is a day-long gathering connecting members of Indiana’s Latino communities with valuable community and educational resources. This year’s expo, with over 100 vendors and an expected attendance of up to 10,000, will continue this tradition, allowing IU to connect with thousands of students and families from around the state. The expo will take place in the Element Financial-Blue Ribbon Pavilion at the Indiana State Fairgrounds, and is free and open to all. 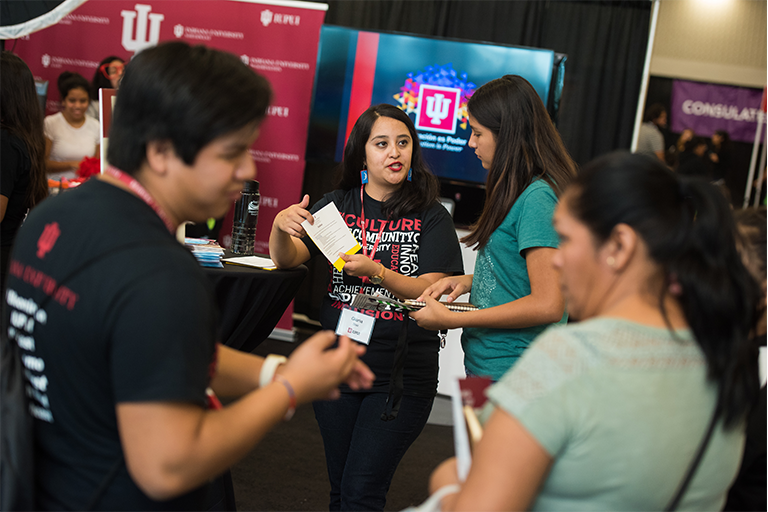 More information about IU’s presence at the 2018 Indiana Latino Expo, including details about the 21st Century Scholars Program, can be found at diversity.iu.edu.